Calling all crazy food combo lovers! 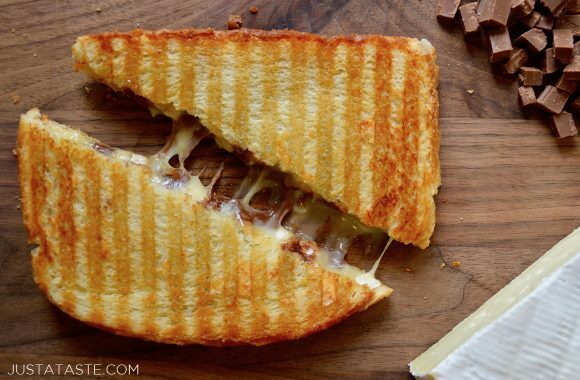 Don’t miss this sweet and savory recipe for Chocolate and Brie Panini. Chocolate with cheese? Has she lost her mind? Not entirely! Although your first reaction may be to cringe at the sight of this unlikely duo, I hope you’ll stick around for a hot, gooey second and allow me to explain. Chocolate and cheese go together like pork chops and applesauce, like spaghetti and meatballs, like Fixer Upper marathons and my average Saturday night. They just work. Mark my words: This combination is almost too good to be true, which is probably why so few people have ever gone the route of sandwiching two such stellar ingredients between buttery, toasted sourdough slices. But I have The Smile restaurant in New York City’s lower east side to thank for clueing me in to this combo. After seeing the panini offered on their menu, and then a similar version (with marshmallow fluff and bananas subbed in for cheese) on The Purple Pig‘s menu in Chicago, I knew the dessert panini trend was starting to take shape. So throw caution (and your pant size) to the wind and give this uncommon combo a shot. I guarantee you won’t be able to stick to just one creamy, crunchy salty-sweet bite. Tune in to the video below for proof! 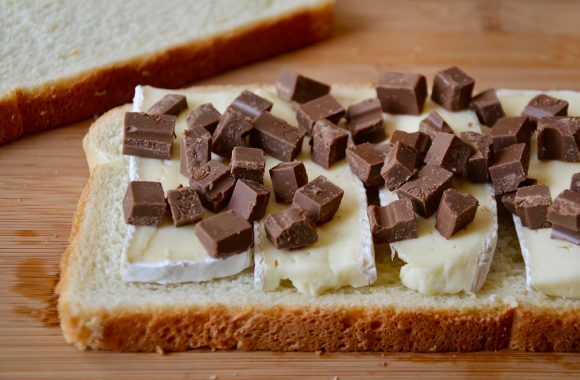 Arrange half the cheese on two pieces of bread, then top each slice with half the chocolate. 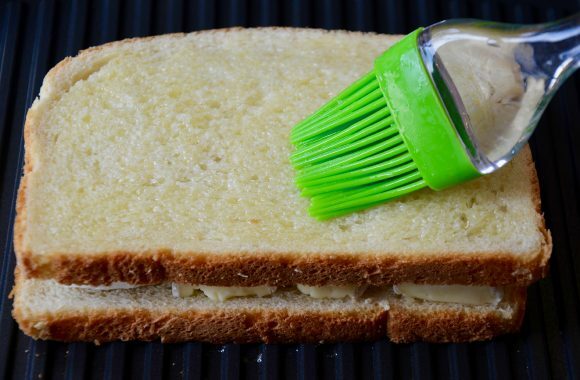 Top each stacked slice of bread with another slice of bread to form sandwiches and brush the tops with melted butter. 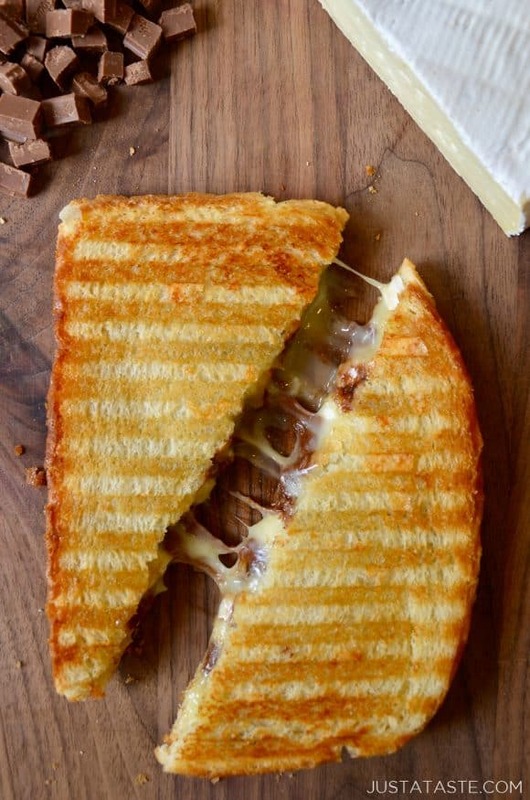 Remove the toasted sandwich from the panini or the pan, slice it in half and serve immediately. Because this is such a simple recipe, it all comes down to the quality of the ingredients you use. Allow yourself to splurge on a higher quality chocolate and wedge of Brie. It'll be well worth it! Brie is much easier to slice when it's cold, rather than at room temperature, so keep it in the fridge until the last possible minute.